The Haverhill Festival, organised by Haverhill Town Council, this year runs from Wednesday 15 June to Sunday 3 July and encompasses everything from opera to hypnotism to children’s shows. One of the headline acts of the festival is Barbara Dickson best known for songs such as I Know Him so Well and January, February. She teams up with pianist Nick Holland on Friday 24 June for an intimate show that explores Barbara’s back catalogue and background in folk music. And if that’s not your scene, there’s music of another kind exploding on to stage on Friday 17 June with Thin Lizzy Tribute Limehouse Lizzy. Matt Hale comedy hypnotist (16 June) delivers something very different. During the night Matt will call for volunteers (who must be 18 or over) to come onto the stage to see if he can make them fall under his spell. Matt promises that his act is tasteful, family viewing with real hypnosis and real fun! There will be silly dancing and voices and acting out imaginative situations but nothing that your granny would cringe at! There’s lots of community based activity on offer with the return of Haverhill History Group’s ever-popular historical walk during which participants can find out more about the town. This year the focus is on St Mary’s Church and the Old Independent Church. There’s also the return of the nature walks at East Town Park and Millfields Way. Guitar lovers will have cause for celebration as there is not only the chance to enjoy the playing of three acclaimed guitarists, Stuart Ryan, John Wheatcroft and Declan Zapala, there is also the opportunity to learn from them and ask questions in a special masterclass before their evening performance. Join the trio on a journey encompassing everything from the romance of the Spanish guitar, Gypsy Jazz, to Celtic sounds for Three Colours Guitar on Saturday 25 June. It’s 4.00pm for the masterclass and at 8.00pm for the concert. In the vein of multi-stranded fims such as Love Actually, With Love From Suffolk is an independent feature film of eight short romantic tales. Not just a funny and tender exploration of relationships, drama and romance but also a love letter to our magnificent county. It will screen on Sunday 26 June at 7.00pm. Once upon a time there were Four Little Rabbits … come and join Quantum Theatre in East Town Park on Sunday 3 July and find out how Peter Rabbit, who knows very well that he is not to go into Mr McGregor’s garden, narrowly escapes Mr McGregor’s clutches. This show, based on Beatrix Potter’s tales, also includes the story of how Benjamin Bunny and Peter dice with cat-danger as they sneak back into the garden. It promises to be a magical show for young and old alike taking them back to the tales of their childhood. Don’t spend a fortune travelling to see a Glyndebourne Opera, just come to the Arts Centre instead. You can see Il Barbiere di Siviglia (The Barber of Seville) for example without even the merest hint of getting wet or tripping over someone else’s hummus. There are also Glyndebourne performances of Beatrice et Benedict and Die Meister Singers Von Nurnberg. On Saturday 25 June from 11.00am Haverhill celebrates, for the first time, Armed Forces Day. It will be a chance to show your support for the men and women who make up the Armed Forces community: from currently serving troops to service families, veterans and cadets. The day, taking place on Haverhill Market Square, will include marching bands and parades, military vehicles, exhibitions and more. At the Street Festival, on Saturday 2 July, some weird and wonderful creatures and street acts perform in the town centre for free. There will be all manner of things you (probably) haven’t seen before, you don’t know who, or what, you might encounter! There’s much more in the Haverhill Festival including a Beer Festival, a talk about ice cream (with free ice cream! ), comedy and film. 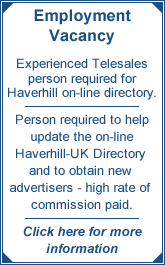 Call 01440 714140 for a brochure or go to the downloads section of the Haverhill Town Council website www.haverhill-tc.gov.uk. Bookings are handled by Haverhill Arts Centre.